Matching gifts are a type of corporate giving program that essentially double an employee’s initial donation to an eligible nonprofit organization. The first matching gift program began in 1954. The GE Foundation created the Corporate Alumni Program that matched employee donations to schools and universities. Since then, companies of all shapes and sizes have created matching gift programs to give back to nonprofits and encourage employee philanthropy. This guide will take you through the basics of matching gifts and will show you how to get started with this extremely beneficial type of corporate giving. Learn more about matching gift programs! Want to try matching gift software? Check out our top pick, Double the Donation. It almost doesn’t need to be stated, but the primary benefit of matching gifts for nonprofits is the extra revenue they bring in! Not every single donor will work for a company with a matching gift program, and those that do won’t have every single contribution matched. But those that do send twice as much money your way. Over time, those matched donations add up! Knowing which donors are eligible for matching gift can help your organization more carefully segment your donor database. If you know which of your donors works for a company with a matching gift program, you can send specialized matching gift messages to them. Matching gifts allow your nonprofit to analyze your donor data in yet another important way. While donors still have to make a donation in order to have that gift matched, the corporate match is essentially a no-cost donation. With matching gifts, your donors are able to give to your organization twice with only incurring the cost of the initial contribution. Matching gifts present a huge incentive for your supporters. They can make two donations for the price of one! Matching gift programs, and really any corporate giving program, encourage employees to put their trust in their employers. Not only do employees feel good about themselves after they make a donation, but they can feel good that their employer is philanthropic as well. This leads to more satisfaction in the workplace, a higher employee retention rate, and happier workers! Check out these matching gift tips. Matching gifts are usually made at a 1:1 ratio, meaning that the initial donation is simply doubled. However, some companies will match at higher ratios, with some going as high as 4:1! Additionally, corporations will institute different ratios for different employees. For example, part-time and full-time employees might be eligible for a 2:1 match while retirees or spouses of employees are eligible for a 1:1 match. Companies usually set aside a certain amount of money per employee, per year for matching gifts. Minimum match amounts can be as low as $1 but commonly are $25-$50. Additionally, companies have different cap amounts for donation amounts. These caps can range from $1,000 to $100,000. Just like matching gift ratios, these cap amounts may vary for different types of employees or retirees. Learn more about matching gift ratios and amounts. 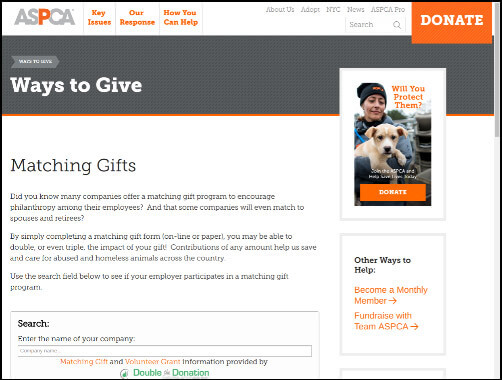 Double the Donation offers nonprofits an easy-to-install matching gift plugin. The plugin can be placed anywhere on a nonprofit’s website, including the donation page and confirmation screen. All a donor has to do is type in their employer’s name to access more information about the specific guidelines, deadlines, forms, and instructions for the matching gift program. Double the Donation makes it easy for donors to learn more about matching gifts and guides them toward the resources they need to complete the matching gift process. Learn more about Double the Donation. 360MatchPro is a great tool for larger nonprofits that want to dig into their data and make the most out of matching gifts. 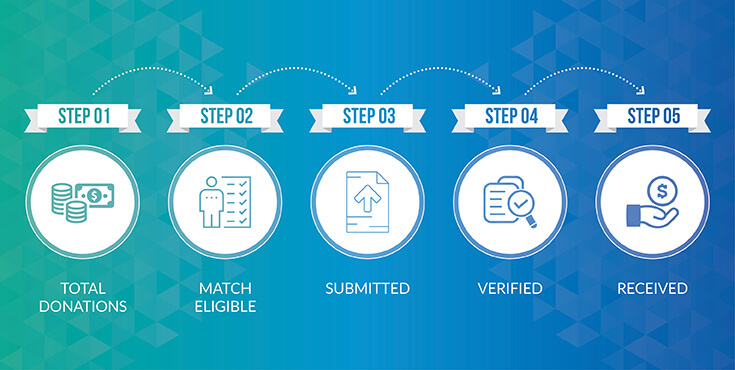 360MatchPro allows nonprofits to identify match-eligible donors based on a variety of factors. Nonprofits that use 360MatchPro can conduct activities such as email domain screening, adding matching gift company name fields to donation forms, bulk screening, and email tracking. 360MatchPro is for nonprofits that want to hone their matching gift outreach and identification. With a suite of tracking and reporting tools, 360MatchPro is on top. 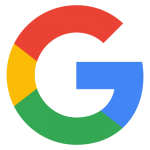 Google will match donations ranging from $50 to $6,000 at a 1:1 ratio. They also have a separate matching gift fund for donations made to disaster relief funds (also at a 1:1 ratio for donations ranging from $50 to $6,000). 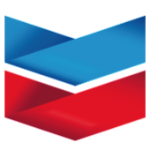 Chevron will match employees’ donations to plenty of nonprofits at a 1:1 ratio. Current employees can have donations ranging from $25 to $10,000 matched at a 1:1 ratio while retiree donations from $25 to $3,000 are matched at the same ratio. 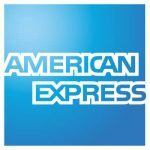 American Express will match current employees’ donations ranging from $25 to $8,000 to most nonprofits at a 1:1 ratio. However, employees who serve on a nonprofit board can have their donations matched at a 2:1 ratio. 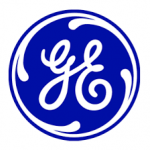 General Electric (GE) will match employee and retiree contributions (as well as donations made by surviving spouses of eligible GE retirees) at a 1:1 ratio. Donations ranging from $25 to $25,000 are eligible to be matched as long as they were made to a U.S. or U.K. nonprofit. Click here for more information on the top matching gifts companies. Fundraising matches are similar to matching gifts. The only difference is that fundraising match programs will double contributions that employees make as well as any funds that they raise for a fundraising walk, run, or cycling event. Volunteer grant programs are corporate giving programs that reward employees who regularly give their time to nonprofits. After an employee has reached a minimum threshold of volunteer hours, they can apply for a monetary grant. In-kind donations are contributions of products or services that a company gives at reduced or no cost to nonprofits. In-kind donations can include equipment for a project, tax services, office space, or food and drinks for an event. Team volunteer grants are just like volunteer grants. The only difference is that in order for employees to take advantage of a team volunteer grant, they must volunteer together for a certain number of hours with a single nonprofit. Check out these 11 types of corporate giving programs. Donor engagement is at its highest during the donation process. A supporter is clearly willing to take time out of their day and money out of their pocket to support your organization. This is the ideal time to promote matching gifts to your donors! You can place matching gift information (or even a matching gift tool) directly on your donation form to encourage donors to look into potentially doubling their contribution right then and there. It’s also a good idea to put a matching gift reminder on the confirmation page that appears directly after a donor submits a donation. See how the Aggie Network promoted matching gifts on their donation page. Your website is your nonprofit’s hub of information. Donors access your site and blog to learn more about current projects, volunteering opportunities, and different ways to give to your nonprofit. Your website should give donors a window into the world of matching gifts! If you have a “Ways to Give” page (and you should! ), you can list matching gifts as one of the ways that donors can support your organization. You can also create a dedicated page just about matching gifts. You can also write about matching gifts on your nonprofit’s blog. Just make sure that you give donors plenty of matching gift information! See web integration in action with the ASPCA. Many of your nonprofit’s donors are on one social media platform or another. They’re tweeting, posting, liking, and pinning content and sharing it with their friends and family members. Are you sharing matching gift content on these platforms as well? Obviously, you shouldn’t be posting about matching gifts 24/7 (you’ll likely drive followers away with that strategy), but you can use social media to occasionally remind donors about matching gifts. Make sure that you include a graphic (when applicable) and give donors a link out to more information about matching gifts. 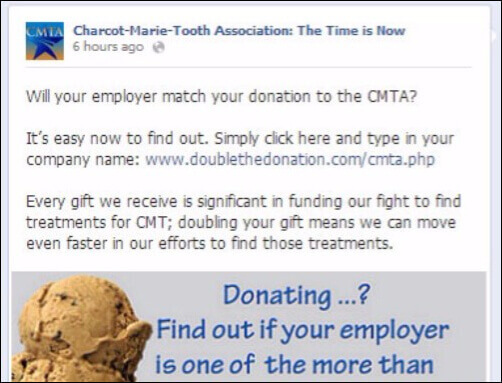 Visit the CMTA's matching gift resource page. Email is one of the most cost-effective communication tools out there. You can easily get matching gift info to all or some of your donors and lead them to the appropriate forms, guidelines, and instructions. All you have to do is mention matching gifts somewhere in your emails! Just like you don’t want to constantly post about matching gifts on social media, your emails shouldn’t harp on matching gifts all the time. Donors want to know about upcoming projects and events, too! 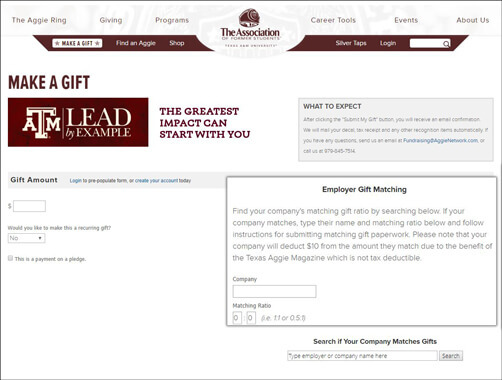 You should include matching gift information in your emails and link out to your dedicated matching gifts page as well. Look for matching gift opportunities in your company. 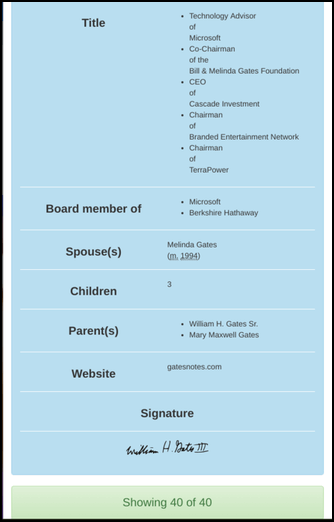 Donor Makes a Contribution to a Nonprofit — A donor fills out an online or print donation form to a specific nonprofit. By installing a matching gift search tool in your online donation form, donors can easily check if their employer offers a matching gift program that benefits your nonprofit. 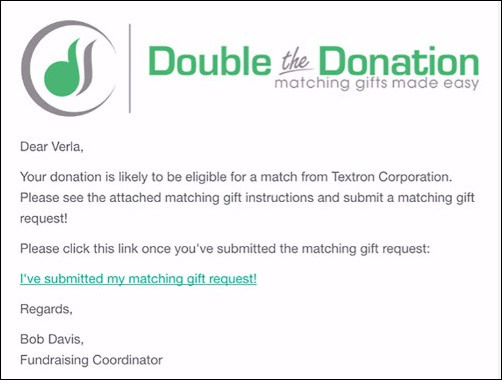 Donor Submits a Matching Gift Request to Employer — A donor can check their employer’s matching gift request protocol on their website or visit Double the Donation to view corporate matching gift profiles that lay out key matching gift guidelines in one convenient place. Company Reviews Donation and Nonprofit to Determine Eligibility — The employer’s matching gift team checks to see if the request meets all corporate expectations and that the nonprofit in question fulfills their eligibility requirements. Nonprofit Verifies that the Initial Donation Was Made — After the matching gift request passes all other guidelines, the employer wraps up the matching gift process by confirming that the initial donation was made to the nonprofit in the first place. If Eligible, the Nonprofit Will Receive a Check from the Company — Once the matching gift request is finalized, the employer will then reach out to the nonprofit in question and appropriately match their employee’s donation with a check. Every company requires different amounts of information in order to accept a matching gift request. Most require proof that the donation was made (provided by the nonprofit) as well as proof of the nonprofit’s 501(c)(3) status (provided by the donor in the form of a tax ID number or EIN number). There are many variations on the matching gift submission process. For instance, some companies will only take electronic submissions while others accept paper forms. Information must be submitted by the nonprofit and the donor in a timely manner. Check out more information on the matching gifts submission process. Prospect research can help you identify eligible matching gift donors. For instance, prospect screenings can reveal information such as past giving history, personal data, and employer information. If you know that some of your donors work for companies with matching gift programs, you can more effectively target and segment your communications to those donors. To track down valuable donor data for matching gift purposes, you can always rely on DonorSearch’s giving tool to get the job done in two easy steps. 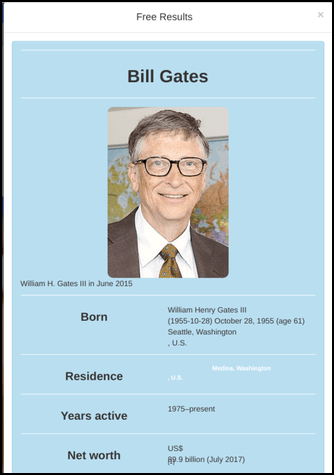 Type the name of a particular donor or business to examine their complete donor data and philanthropic history. 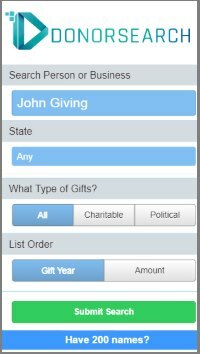 You can even hone in on giving specifics like location, charitable vs. political gifts, and gift year and amount. Check out our free results to determine if the person or business you searched for is qualified to contribute matching gifts to your nonprofit. All of this information can help your nonprofit send tailored communications to a matching-gift eligible donor or partner with a corporation with a strong matching gift program already established. Learn more about prospect research for matching gifts. 1. TOTAL DONATIONS: In order to know how many matching gifts you’re receiving as part of the whole, your nonprofit has to know the total number of donations it’s receiving on a monthly or quarterly basis. 2. MATCH ELIGIBLE: Your nonprofit needs to determine which donors are match eligible. This can be accomplished by researching the donor’s employer’s matching gift criteria or by examining the donor’s company email address. 3. SUBMITTED: Your nonprofit can also analyze how many donors have submitted matching gift requests to their employer. 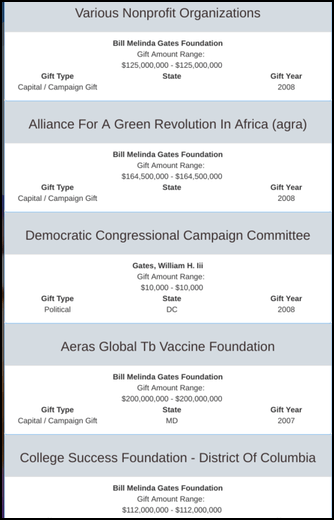 You can filter through this data faster by documenting matching gift donor data in your donor management software. 4. VERIFIED: Likewise, your nonprofit needs to verify that it received the donation from the donor before your organization will be eligible to receive the matching gift. 5. RECEIVED: Finally, take special care to track how many matching gifts you received, the value of each of those gifts, which donors submitted those requests, and which companies the donations came from. Check out these matching gift metrics your nonprofit should track. Maximize your fundraising and take it to the next level by catering to companies that donate to nonprofit. 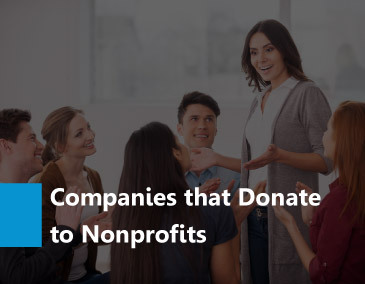 Discover more about companies that donate to nonprofits! Take a look at the companies that donate to nonprofits. Tons of your donors are eligible for their employer’s corporate matching gift programs. Find out how to reap the benefits of the matching gift programs offered to your supporters! 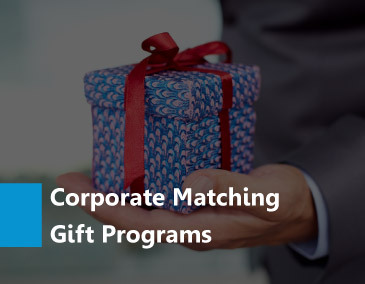 Check out the basics of corporate matching gift programs. Look into corporate funding and ask for donations from capable companies! Check out the companies that accept donation requests to increase your revenue! 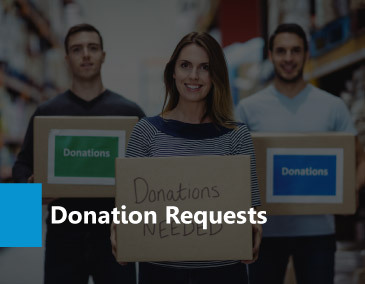 Learn about companies that accept donation requests.